N800: The Story So Far! This has been a long time coming! I’ve wanted to write this post for over two weeks now, however something or the other kept coming up. Even now I’m writing on the N95 (with the key press bug)! First of all I would like to thank WOM WORLD for sending across this great device. I’m especially grateful to Siobhan, Lucy and Donna who all helped get this done! Thanks a ton! Really! Recently I read this post over at Symbian World which compared the N95 to the N800. Norman had some great observations about various contrasting aspects of post devices, be it the screen, size, weight or browser. However I would look at the N800 differently. It is often referred to as an internet tablet; however I’d like to call it a phone companion. This is one device which you simply cannot own in isolation. But once coupled with a smartphone, it surely is a great combo. In the coming posts I will cover the N800 in various aspects, as a standalone device, as a companion and a multimedia gadget. This just goes to show how flexible the device is. Although it is primarily targeted at the business tool segment and as an internet tablet it actually is much more. The moment I got the device and opened it up, it brought back memories of another Nokia touchscreen device I owned, a now defunct Series 90 phone known as the Nokia 7710. Both devices have similar structure, dimensions and weight. However they have their differences too, the 7710 is a proper telephone, and it also featured a great 1.3 MP camera (it was nice for that time). 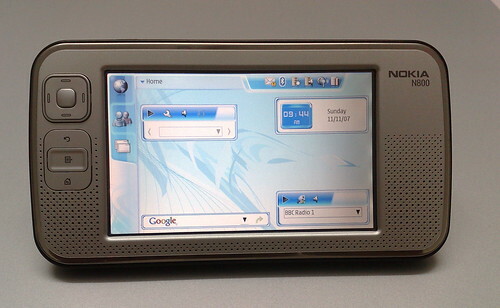 The N800 now based on the Maemo OS, Linux has taken the spirit of the 7710 way forward. It features a gorgeous 4.13″ screen, a much improved touch screen, a decent set of stereo loud speakers, a 3.5mm jack and a miniUSB port. I’d have liked a decent camera too. As soon as you power on the device for the first time the initial setup wizard helps you get started. This little feature is very useful and it quickly and easily sets up your existing phone to work with the N800. After the setup the N800 can use it as a Bluetooth modem to connect to the internet via 3G/EDGE/GPRS. It can also, through the file manager, then access all files stored on your phone; very convenient and I really like this sort of seamless connectivity. This no doubt is one of the better touch screens out there. I’m no fan of touch screens and try and stay clear of them. The biggest drawback of the N800 is the lack of a physical keypad. I was skeptical of the touchscreen right from the start. The N800 however touchscreen proved to be better than I anticipated after my brush with some WinMo devices. If text entry is out of the way the screen performs reasonably well, or rather almost brilliantly. The ability to use fingers or the stylus to move around the webpage, picture or the like is genius. This feature pleases all, even the non geeks who have no clue what the device is or does. I was sitting with family when a cousin abroad called to say she had sent pictures via email. Sitting there itself I pulled out the N800, hooked it up on the internet via the N95, got the images down and put them on a slide show for all to see within minutes. The question on everyone’s mind was, “are laptops obsolete now?” Later on, I passed the device on for them to zoom and view the pictures on their own and they too loved the ability to play with the photos just with their fingers! Now of course the N95 could have done all of that with the safari browser and great TV out, however it was the beautiful screen that sealed it for the N800 as the you don’t have the TV out cable on you always. The N800 was thus a great digital photo frame! One aspect of the N800 which impressed me the most was seamless Bluetooth connectivity. There was almost nothing the N800 couldn’t do via Bluetooth. Once a phone is set up with it, the file manager displays a link to the Bluetooth devices. Select the appropriate device and within seconds you have the entire C: and E: drive’s contents available to you. If you happen to want to listen to a song say which is on the E: just give the name a double tap and the song instead of first needing to be sent across is streamed across and is playing within seconds again. Brilliant. This feature works especially well with Bluetooth v2 EDR (Enhanced Data Rate) devices such as the N95. It worked without a fuss even with a Sony walkman phone. What this means is that you do not need to duplicate your music and videos on the devices. But the current OS supports a very limited amount of codecs so that is somewhat of an issue. This indeed is one of the best browsers on any handheld device. The full screen layout is a treat to surf on. The dedicated zoom and full screen buttons on top of the device a big plus. You Tube video is a little jerky but at least it works! Wifi works well and the page loads almost instantaneously. Image intensive websites are not an issue and the 128 MB RAM seems ample. N800 wasn’t really built for games. However the advantage of open source has clearly kicked in and now we have games like Bomberman running on the device. The N800 ships with four games namely Chess, Blocks, Mahjong and Marbles. The first thing I did with the N800 was play Chess on it. The experience was really enjoyable so much so that my ‘9’ year old cousin was hooked! I personally prefer Blocks and found it to be a nice pass time while a friend enjoyed Marbles immensely. All of this goes to show the N800 caters to quite a few tastes out the box. With mods and emulators that keep coming in frequently and the gorgeous screen put in together the N800 makes for a reasonable gaming device. After all it too is a part of the Nseries range and I’d have liked the Ngage platform available for it too. Wishful thinking! For a detailed look at gaming on the device look this up and some great games can be found here. This is a small stumbling block for the N800. However for small IM’s and Emails the device does hold up but if comes down to some serious typing a Bluetooth keyboard is a must. What is nice is that the device differentiates between the stylus and the finger. When you press it with a finger the full screen keyboard pops up whereas with the stylus the conventional keyboard that you would expect. The full screen keypad really made living a little easier! The biggest advantage of having an open source operating system is that there are loads and loads of third party applications to choose from. The N800 also immensely benefits from the developer community. There are some amazing applications available and I really enjoyed trying out a few. Rdesktop allows you to control your computer from the N800 itself with the computer’s display being shown on the N800. This was one of my favourite applications. For more please have a look here, here and here. This surely is one device where you wouldn’t run out of apps to try! However there is one thing that has bugged me since I got the device, the N800 comes with an FM Radio but the application that allows you to use it isn’t installed at all! Someone who doesn’t know the device well would never come to know that it has a built in FM tuner too! Tableteer on the browser does point you in this direction but it isn’t very apparent. Why do this Nokia? I hope the new OS sorts this out! After playing around and extensively using this device I as many others have had the question that who was this device built for? The answer as it seems to be is that one it was built for anyone who could afford it and on a more serious note for anyone who needs a great supplement for his smartphone which fulfills what the phone lacks – a bigger screen, more memory and serious web capabilities. ur right…. 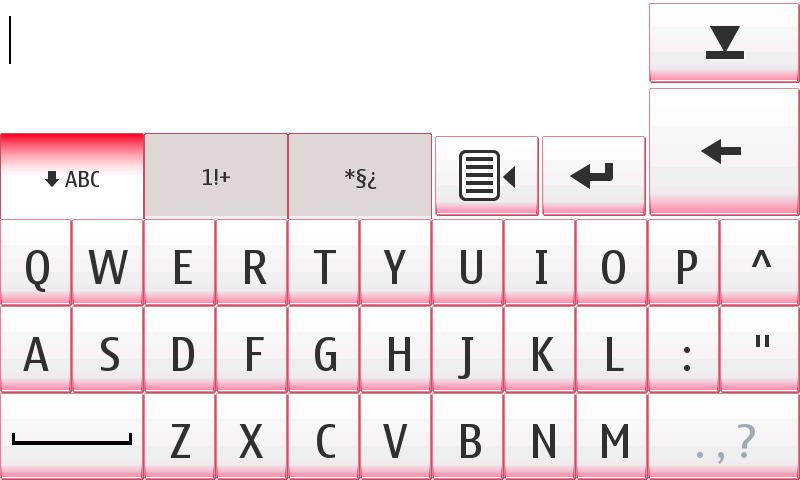 what it lacks is a physical keyboard…. which is certainly there in the N810 internet tablet…. lol nokia has their way…. imporiving by taking really small steps forward at times…. Oh yeah, however the N810 has lost the second memory card slot! Now that the tablet started supporting popular video codecs they take away the storage! Not fair!